This delicate, creamy pudding relies on the natural sweetness of coconut milk rather than refined sugar. 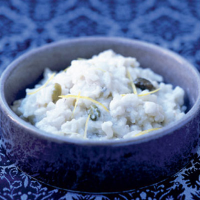 It's delicious on its own, with a fruit compote, or try adding fresh berries to the rice while it cooks. This is dairy-, gluten-, wheat-, soya-, egg- and nut-free. Put the rice into a shallow baking dish with the cardamom and citrus zest. Add the coconut milk and mix gently. Cover with foil and bake for 1 hour, stirring occasionally to ensure the cardamom is well buried and can release as much flavour as possible. After an hour, uncover the dish then cook for 30-45 minutes more, or until the rice is soft. Serve warm or at room temperature.